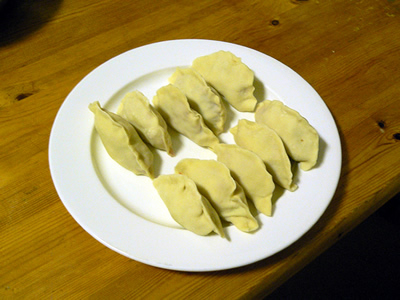 Gyoza is something like ravioli... meat and vegetables are filled in a skin, which is made from flour. 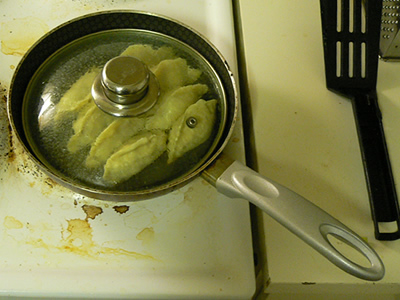 After filling, you can fry it, boil it or steam it. 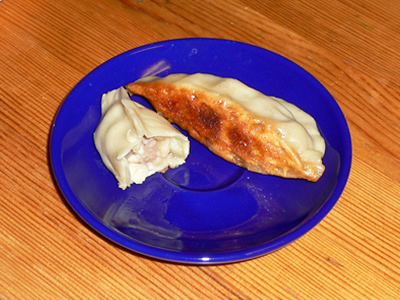 Gyoza is not a traditional dish in Japan -- it was derived from China 50 years ago (during the WW2). 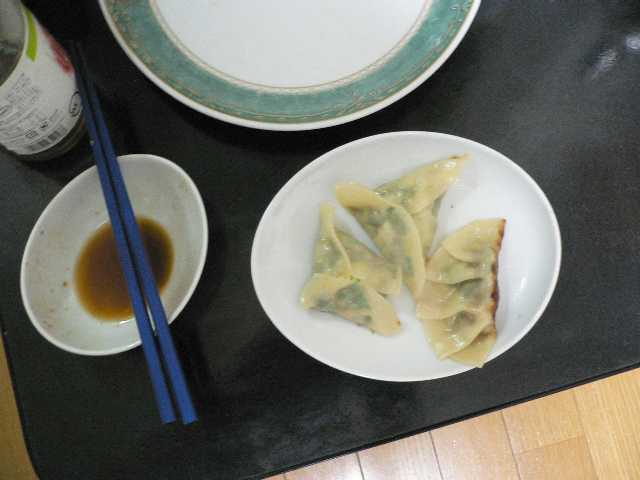 Although many Japanese people think it is Chinese dishes, there are some differences between Japanese and Chinese gyoza. The biggest difference is skin and way to cook. 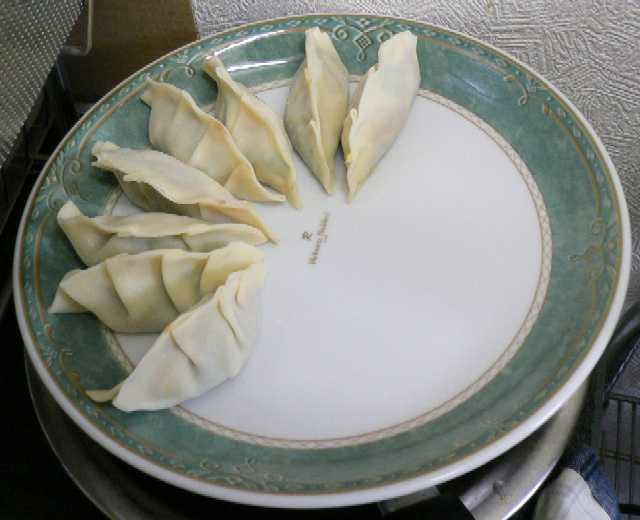 A Chinese gyoza has thicker skin, and usually boiled. In Japan, the skin is thinner and steamed after fried the bottom. Here I explain the way to make a skin from flour. 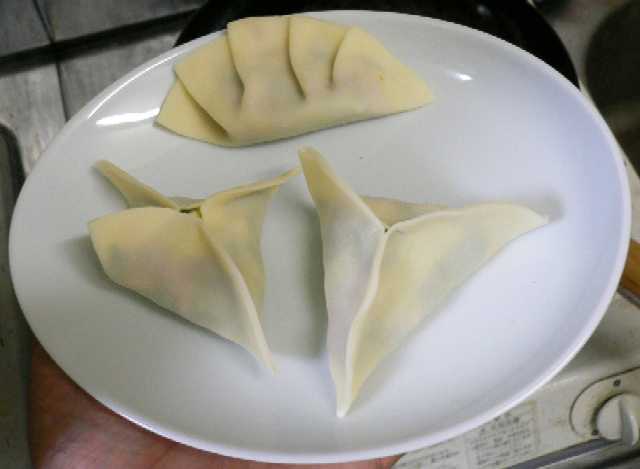 We usually use readymade skins for gyoza, but it doesn't take so much time to cook the skin by yourself, and it is worth spending time. Prepare fillings. 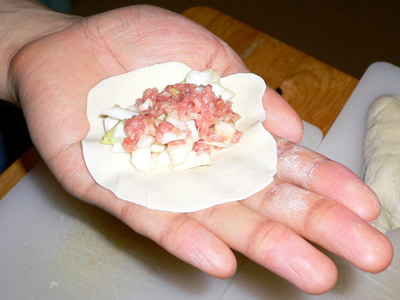 Cut vegetables into small (3mm x 3mm) pieces and mix it with minced pork. Put some soy sauce and a little starch. 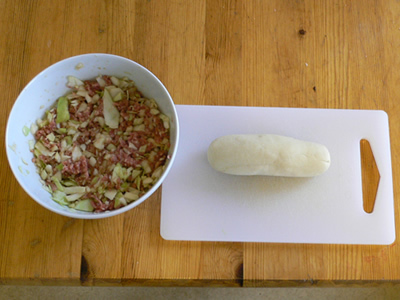 Also prepare the dough. Mix flour and water. Add water little by little, in order not to make it too sticky. After kneading well, wait 20 minutes. 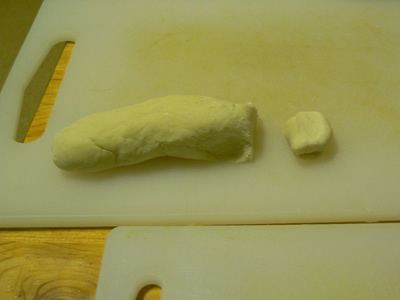 Cut the dough into small pieces. 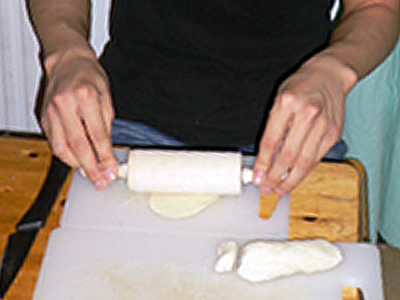 Make it thin with a roller. 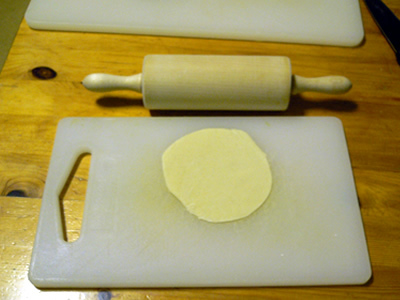 The adequate diameter is 5-8cm. And close it. Use a bit water to close the edge. You can prepare as many you can, as long as you can put up with the hunger. Pour some oil, and fry the bottom. When the bottom get brown, put just a little water (with a little starch), and put the top. When the water has gone and skin gets transparent, it's ready. 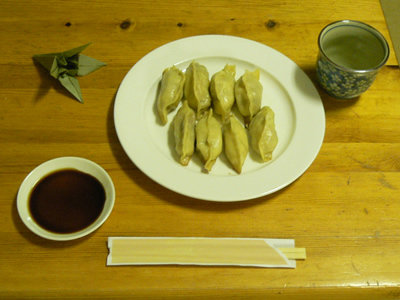 We eat it with a dip sauce, which is mixture of soy sauce and vinegar (you don't need to heat the sauce). You can also put some chilli oil (ra-yu). 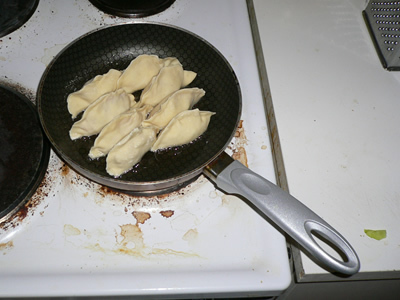 The back of gyoza is burned and brown. A thin skin gets clispy and good filling is juicy. This picture is taken in Japan. The skin is readymade one, and much easier to fill the inside:D It's a good idea to make some pleats (only in one side). One in the top of the picture is a traditional way, the other two are my invention. 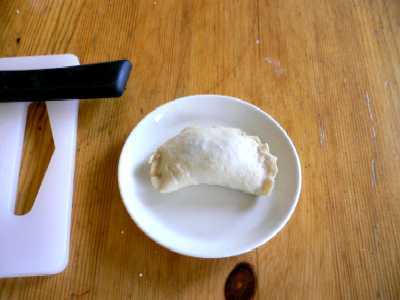 You will find the original shape is most efficient to put in a pan and fastest for the heat to get through.